As he clings to life at a Rancho Cordova animal clinic, we stand watch at the little brown bear’s bedside. Plucked from the flames by brave firefighters, the orphaned cub as come to symbolize the plight of those affected by the hundreds of California blazes. Now, you folks know by now that all the “tasteless” cartoons I turn in at work that are summarily rejected end up on this blog. I just want you to hurt like I do. 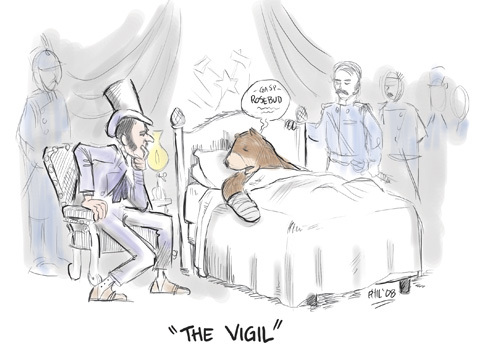 The above scene is based on several etchings from the period depicting Abraham Lincoln’s final hours. It’s supposed to be funny, so all of you folks who believe bears stepped right out of a Disney attraction, I’m sorry to burst your bubble. This entry was posted on July 24, 2008 at 6:06 pm and is filed under Thoughts & Musings. You can subscribe via RSS 2.0 feed to this post's comments. You can comment below, or link to this permanent URL from your own site.